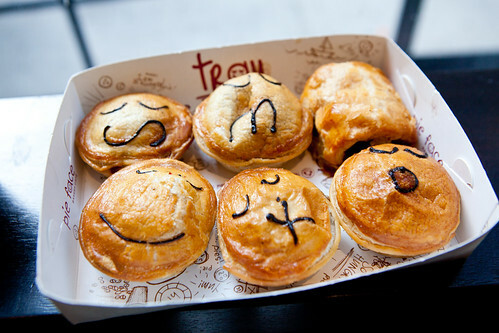 I’m a big fan of pies. I don’t care if it’s sweet or savory. I’ll eat them all. 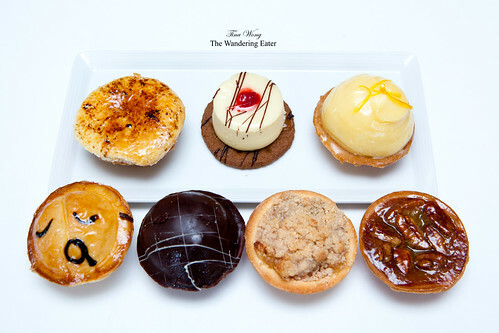 This lead me to the Australian-based bakery Pie Face in Midtown West, about a block from the Sullivan Theater. 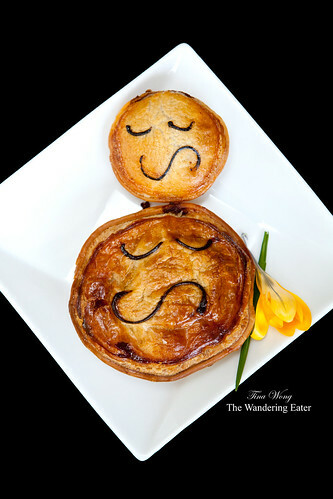 Inside this corner bakery, you’ll be seeing a lot of adorable smiley faces (or cute semi-frowns), as it’s the company’s way of deciphering the seven different flavors of pies. The flavors are globally influenced but some are familiar. There were sandwiches, wraps, and soups but I was there mostly for the pies. 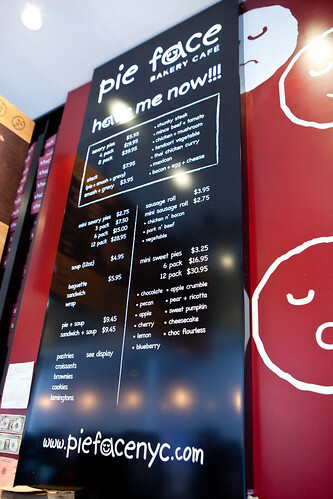 Curious about their coffee, I ordered the Flat White, “Kick My Arse” strength (the strongest brew; medium size $3.45). It was a pretty darn good cup of coffee (and it’s strong enough). 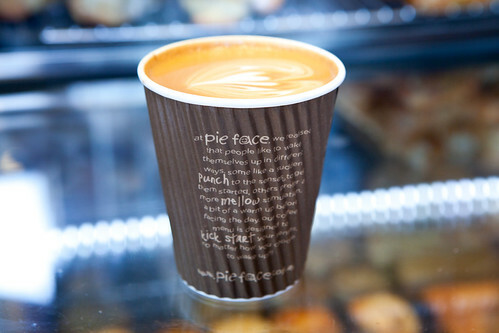 If you haven’t tried a flat white before, it’s like a latte but a touch less milk. The latte art was a nice touch. It’s a good option to have a cup of coffee beyond the typical Starbucks. There were cute names to indicate the strength of your brew such as “start my heart,” “open my eyes,” and “still asleep,” from next strongest to decaffeinated. I really admired the design of their unusual paper cup. It’s pretty ingenious that it has the ribbing all around the cup to insulate heat of the beverage from your hand. The sausage roll was unexpectedly my favorite. 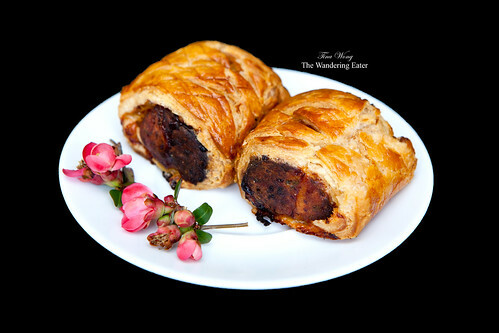 I loved how meaty and robustly flavored it was and the puff pastry was incredibly flaky. 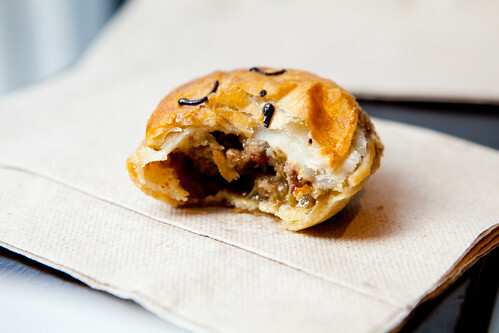 I found it a bit surprising to see fine shreds of carrot mixed within the filling but it worked. 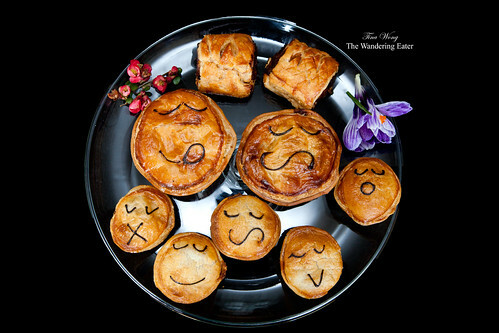 I brought back some of their pies and sausage rolls to share it with friends (both sweet and savory). Of the ones that I haven’t mentioned earlier, their breakfast pie Bacon, Egg & Cheese (regular size $5.95) was delicious. If there’s bacon (or any pork fat), it’s generally bound to be good. The regular sized chunky steak pie ($5.95) was felt more substantial to eat even though I had about 1/4 of the pie, compared to the mini. The tandoori vegetable really hit my palate with its fiery spices without being consumed by heat. Their chicken n’ bacon sausage roll was great ($2.95). I really like how they spiced the filling and I wish I could have this as my weekly weekend breakfast. 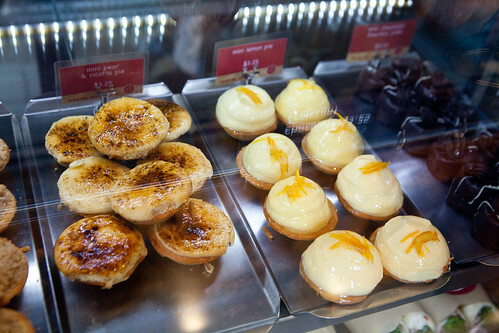 Also the mini sweet pies and cheesecake ($3.25 each) were good to have as well. The sweet pies were thankfully not sweet. The lemon pie had a very substantial amount of sweet lemon cream with a smidge of crisp crust that amazingly held up all of that filling. The cheesecake was pleasantly soft and creamy. The ricotta and pear pie was good, though the crust was a bit thick for my preference. I liked both types of apple pies. The chocolate pie was essentially a chocolate mousse tart, like the lemon pie, it had a hefty amount of mousse under a chocolate glaze. Despite eating all of those sweet pies, I was really interested in the Australian specialty cake lamington ($4.25 each) since I’ve heard and read so much about them as of the recent years. This cake was pretty darn good. 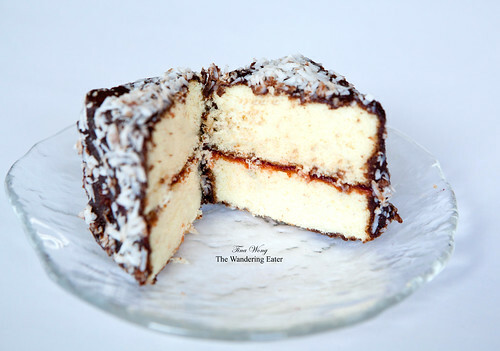 The large cake cube (about 4 inches all around; easily shared between two) was a dense, fine-crumbed white cake that was moistened by the smear of sweet raspberry jam in the middle, coated in dark chocolate ganache and coconut flakes. Overall, the cake is barely sweet, moderately moist and I prefer it that way. 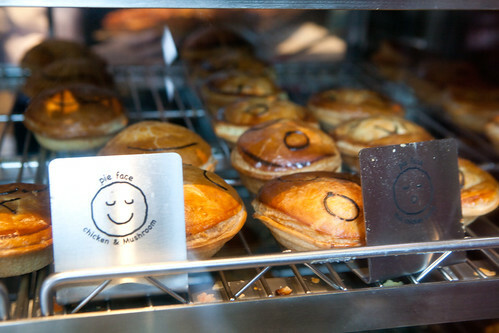 Pie Face is pretty much the only place I know that does sell both savory and sweet pies in Midtown that does taste delicious. 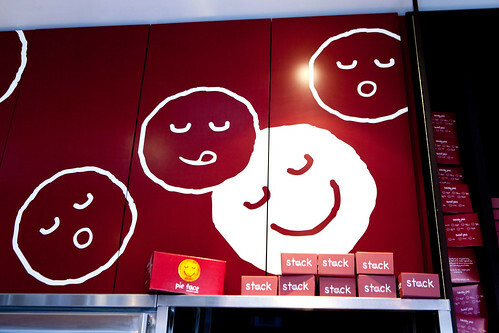 Their coffee is very good compared to a certain nearby coffeehouse. If I were around this area or have a major craving of pies, this would be my go-to spot for pies to go. The pies do keep well overnight that it doesn’t burst in my oven when I take it out directly from my fridge and place it into my oven. Note: No seating available and standing room is limited, especially when it’s busy. 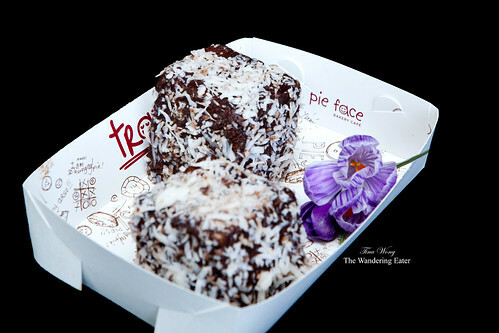 A minor quibble, but Pie Face is on the same block as the Ed Sullivan Theater. Mmmm….thanks for sharing this find. I’m certainly going to check this little gem out.